Toni Freitas is part of the ESRC Genomics Forum writers team covering the Edinburgh International Book Festival 2011. 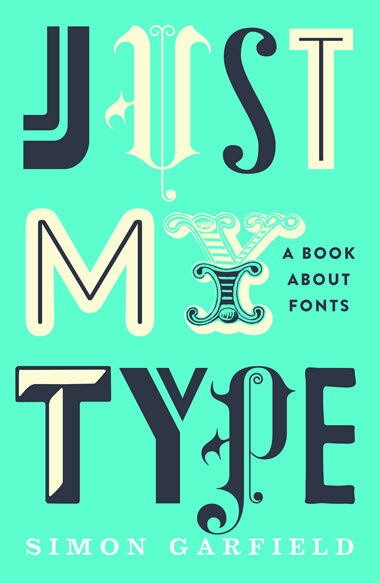 Do you know what your font choice says about you? Have you ever really thought what people might feel when they read a letter or email that you have typed without considering the font? Do you just use the default setting? Or have you carefully chosen your font? On Friday, 19 August, the Edinburgh International Book Festival hosted Simon Garfield, author of Just My Type. You might think a presentation and discussion about fonts would be quite a geeky, specialist talk, but you would be wrong! Fonts influence our lives every day: every email, billboard, newspaper article, junk flier through your mail slot, and wedding invitation you read has used a font that, no matter how subconsciously, evokes an emotional response. Simon gave a fantastic presentation, giving examples of the stories about fonts that he tells in his book. He even interviewed Sir Paul McCartney. What does Sir Paul have to do with fonts? Just think of that particularly long ‘T’ in the Beatles logo. And did choosing Gotham as THE font for his campaign get Barack Obama elected President? Read Just My Type for the full story. This event made me really think about how much fonts influence our lives. You may not be able to name more than two or three fonts (Times New Roman, Arial, and Helvetica perhaps) but you will feel something when you see a font. How does this make you feel? Or how about this font? And what about this one? That last one, Comic Sans, may be the most controversial and emotional of all. There are campaigns and documentaries about Comic Sans; many want to ban the font from the world, others think it is the greatest font out there. You can also take someone back in time by using fonts that are iconic of the 1920’s or the 1960’s or a Ye Olde English font. Many of the world’s biggest brands have logos that don’t have any symbols, but rather an iconic font that is recognised by everyone. Just think Coca-Cola or Disney, or even Gap. I’m sure you can instantly conjure up what these logos/fonts look like. These companies and thousands more know what fonts can make people feel. You may be aware of the furore that Gap encountered when it tried to change its logo in October 2010. ‘Tried’ being the operative word; after only one week, the company ‘listened’ to the public, who resoundingly ridiculed the change and font choice, and changed it back to its original logo/font. Many companies have run into outcries due to font choice. London 2012 Olympics is another one everyone loves to disparage. That one took me two days to figure out that the shapes in the background were supposed to read ‘2012’. More things I learned from Simon Garfield: do you know why the phrase ‘the quick brown fox jumped over the lazy dog’ exists? It’s a pangram used by typesetters and font makers to display all the letters of the alphabet. Ironically, thanks to YouTube, there is now actually a video of that very thing happening. But more than anything, I learned that fonts aren’t to be taken lightly. When writing anything, I certainly don’t want to choose a font that someone may find offensive, or even worse, boring! So do you have a favourite font? Or is that pull-down box at the top of your Word document gathering dust? Go on, you know you want to play around…And if those don’t satisfy your font craving then there are thousands of fonts out there on the internet just waiting to be downloaded. If you were a font, what font would you be? As the Events Manager at ESRC Genomics Forum, Toni Freitas is responsible for conferences, exhibitions, seminars, workshops and public lectures. Originally from Washington State, USA, Toni has a Masters in Creative Writing and has had several short stories and poems published.